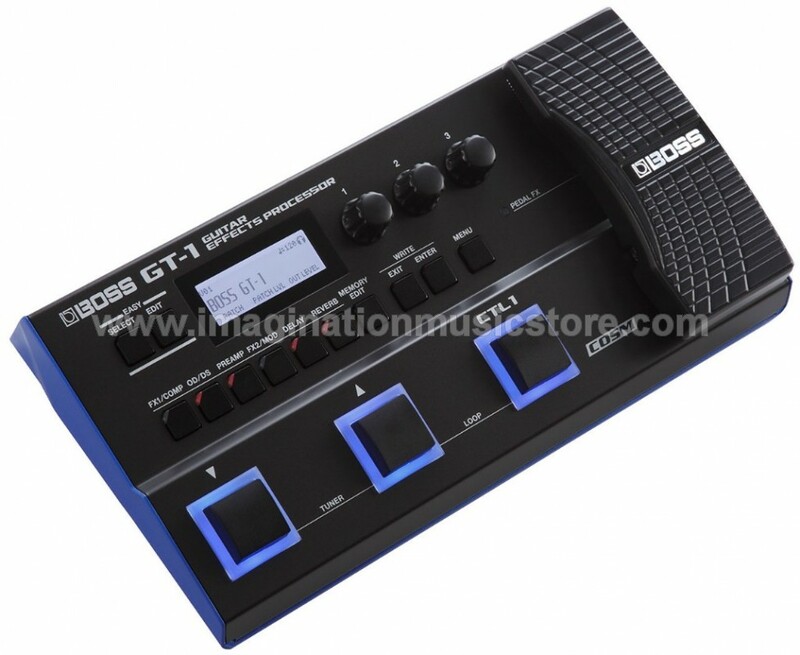 Powered by their flagship GT-series engine, BOSS's GT-1 guitar multi-effects pedal packs their best amp models and effects into a compact floor unit. A streamlined interface makes choosing and tweaking patches quick and easy. Keep an eye on your parameters with the easy-to-read backlit LCD. Take command of your performance with the GT-1's assignable control switch and expression pedal. Enjoy a clean, noise-free signal, courtesy of 24-bit converters and BOSS's proprietary Adaptive Focus method. The BOSS GT-1 guitar multi-effects pedal fits easily in your gig bag, thanks to its smooth, modern design, and runs for up to seven hours on four AA batteries. The GT-1 is armed with BOSS's flagship-class GT sound engine, so it yields exceptional tone and incredible sound-shaping capabilities. There are 108 effects packed into the GT-1, ranging from classic stompboxes like the OD-1 Overdrive to modern MDP-powered effects. A plethora of COSM amp models is also at your fingertips. There's even a 32-second phrase looper onboard! BOSS's proprietary Adaptive Focus method improves the signal-to-noise ratio of the 24-bit converters. And everything is jammed into a 2-pound floor unit that fits easily in your gig bag's accessory compartment. When we tested out the BOSS GT-1 here at Sweetwater, we found that it's child's play to navigate around its streamlined interface. Beginners can discover cool tones right away, and experienced guitarists can dial in advanced parameters quickly and intuitively. Select patches by genre, distortion, or effect type with the Easy Select function. Effortlessly tweak drive, modulation, and echo tones with the Easy Edit function. Clearly laid-out panel buttons provide quick on/off switches for effect groups and unlock deeper parameters for fine-tuning your sound.�A backlit LCD makes monitoring your parameters a breeze. Achieve control over patch selection, tuner access, looper control, and more with the BOSS GT-1's footswitches. The freely assignable control switch serves as a tap tempo, effects on/off, and more. The onboard expression pedal manipulates volume, wah, and other effects parameters. Increase the GT-1's capabilities with up to two external footswitches. Or add a second expression pedal for more real-time control. You can also plug the GT-1 directly into your DAW via USB for recording and re-amping. Download free patch collections for your GT-1 from BOSS Tone Central. These patches were crafted by professional guitarists and are dialed in and ready to use. They also make great starting points for players who want to craft their own custom sounds. The free BOSS Tone Studio editor/librarian software provides integrated access to all of BOSS Tone Central's patch collections. The BOSS GT-1 packs awesome tones into a compact guitar multi-effects pedal.